I'm often asked if I knit all the samples in my booth. 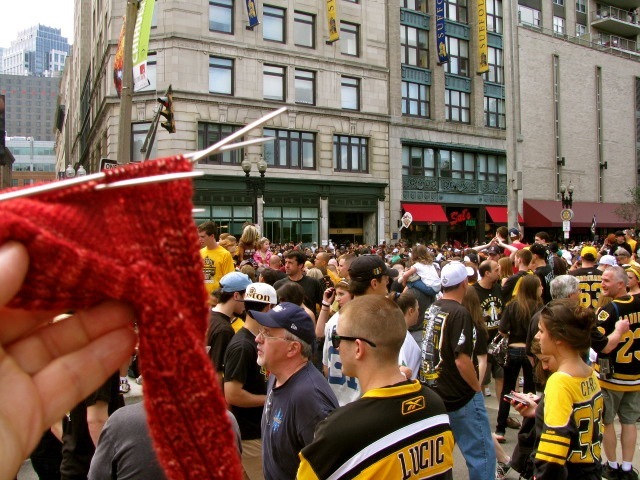 While I knit many of them, I don't knit them all. I have some wonderful, supportive friends who offer to knit booth samples for me. Breakwater, the newest addition to the booth, was knit by a friend. Shown here on my trusty model Veronica. This one piece, top down sweater is perfect for those days when you need a little something extra. The design includes waist shaping and comes in a wide range of sizes. 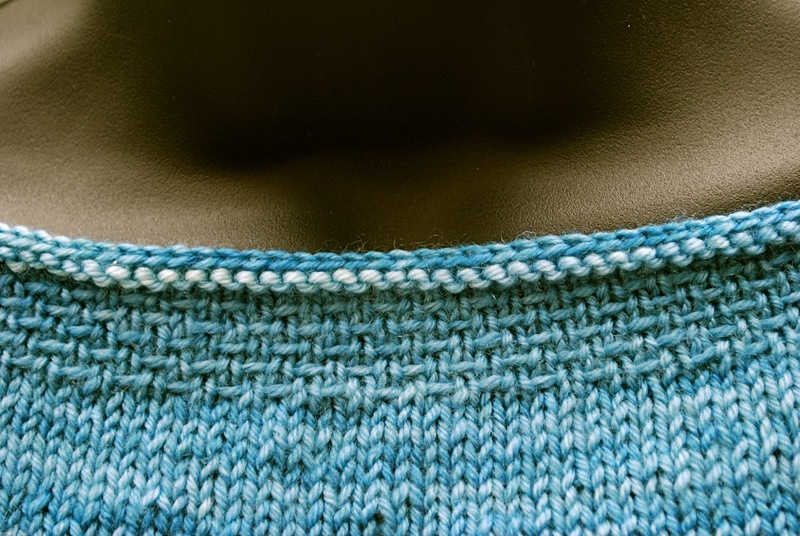 The cuffs and neckline are finished with a slip stitch trim. 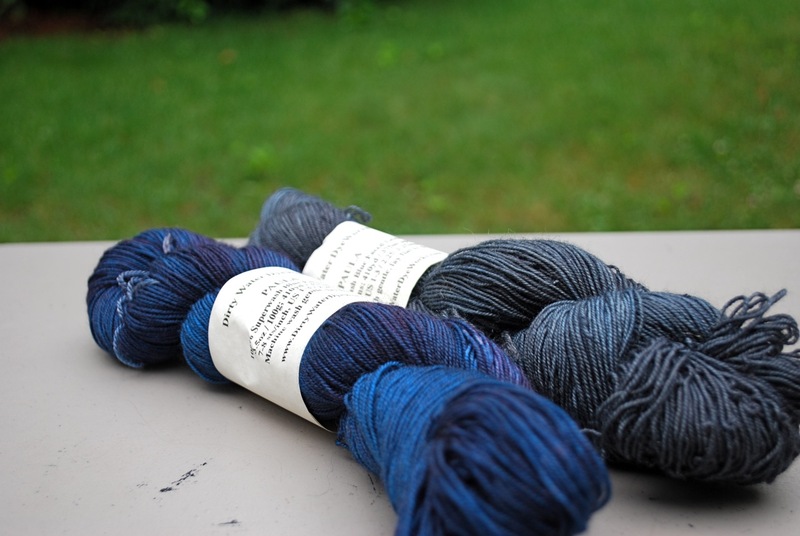 The yarn is Dirty Water DyeWorks Bertha. The colorway is new and doesn't have a name yet. Breakwater is a versatile sweater that will go with just about everything. I may have to knit one for myself. 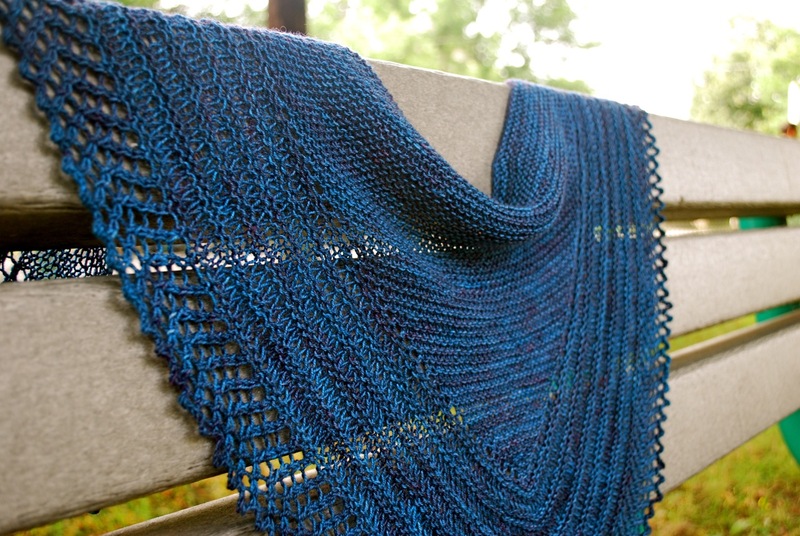 Simmer Dim flew off the needles this weekend. I just got comfortable with this project, and then it was over. I'm on a tight schedule. 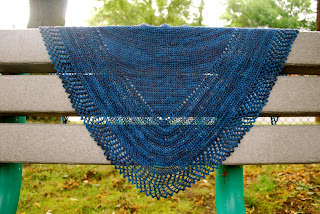 Simmer Dim is headed to Sock Summit, so I didn't waste any time in blocking it. 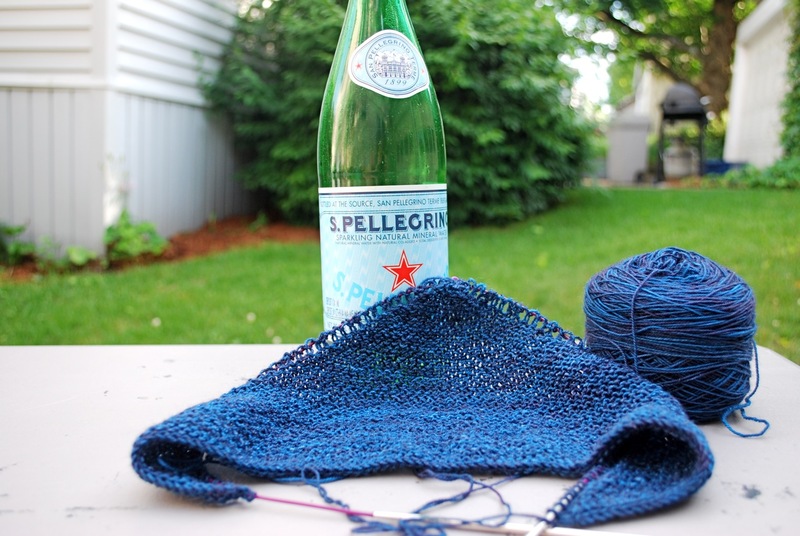 This design starts with a center garter stitch triangle. 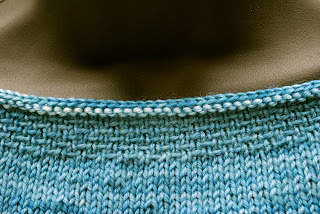 Stitches are then picked up along two sides of the triangle. The next section uses increases and two different size needles to create a light, airy pattern. 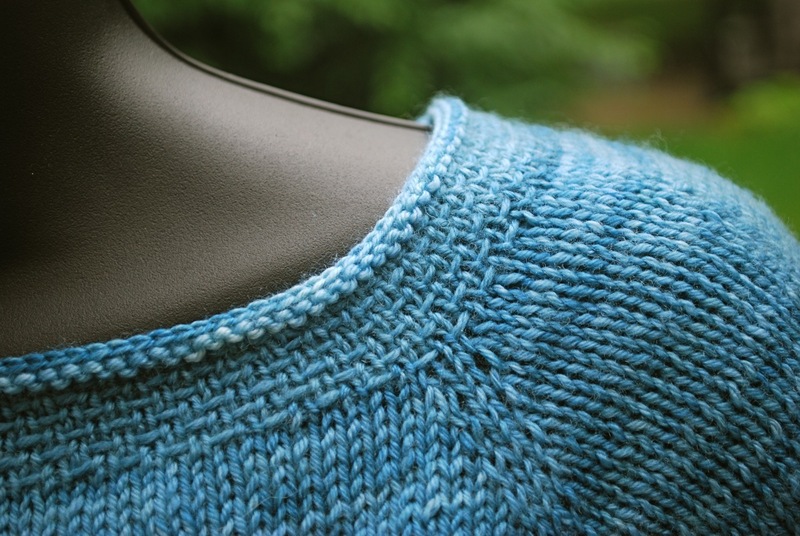 The outside edge is finished with a simple lace pattern and a picot bind off. 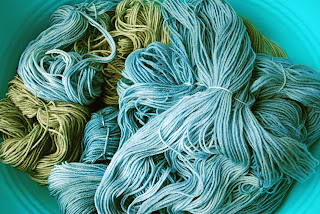 The yarn is Dirty Water DyeWorks Paula, colorway Peacock. Simmer Dim is a versatile little shawl that would also make a nice gift. 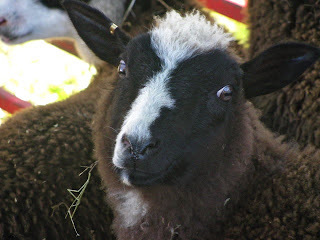 In other news I'm sponsoring a giveaway over at Juniper Moon Farm. Hop over and take a look. Don't delay. Today is the last day to enter. 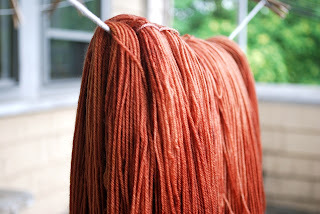 The past few days have been dedicated to dyeing. And the weekend holds more of the same. All of this dyeing really cuts into my knitting time. Alas, there isn't much progress to report on Simmer Dim or any other knitting project. The upside to all of this dyeing is that I have plenty of inspiration for new projects. The challenge is deciding which new colors to use. 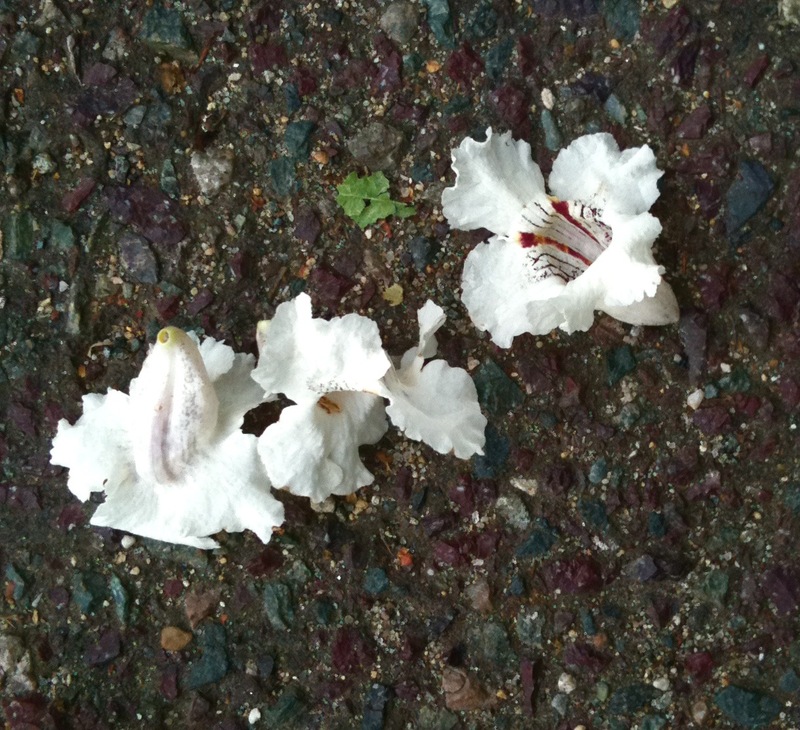 My color inspiration for the week comes for an unlikely spot - a parking lot. 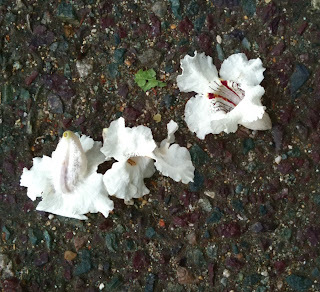 Delicate blossoms on rough pavement. It's officially summer, and the heat is on. I've been brewing new colorways, and the dye pots are on. 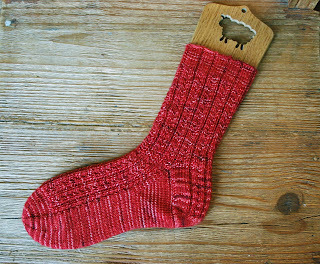 I'm planning a new booth sample or three and finalizing shipping plans for Sock Summit. Non-stop busy. Just so I don't crash and burn, every once in a while I take a break from mixing, dyeing, planning and knit a few rows. It helps clear my mind and keep me calm in the face of utter chaos. The newest project on my needles is Simmer Dim. Yesterday when I needed a break, I picked it up. 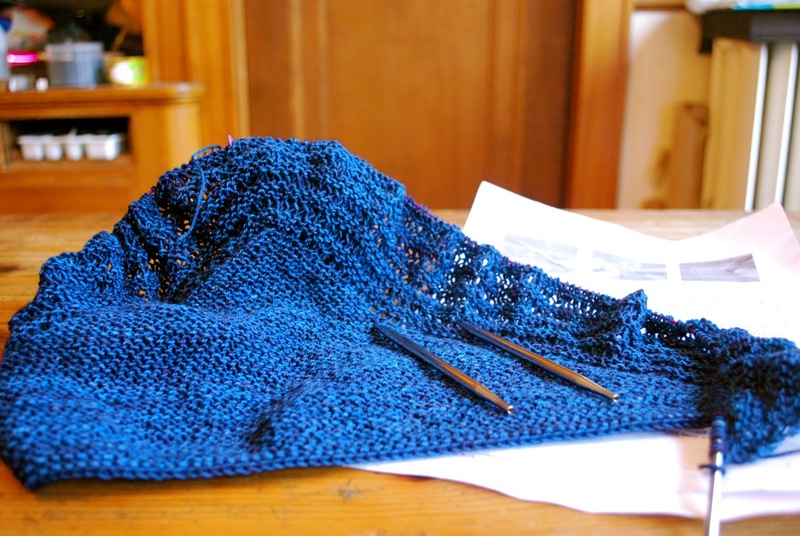 The center triangle was finished, and I was starting the mostly garter increase section. This section has a 6-row repeat. Should be easy enough. Simple knitting with a few increases thrown in for good measure. 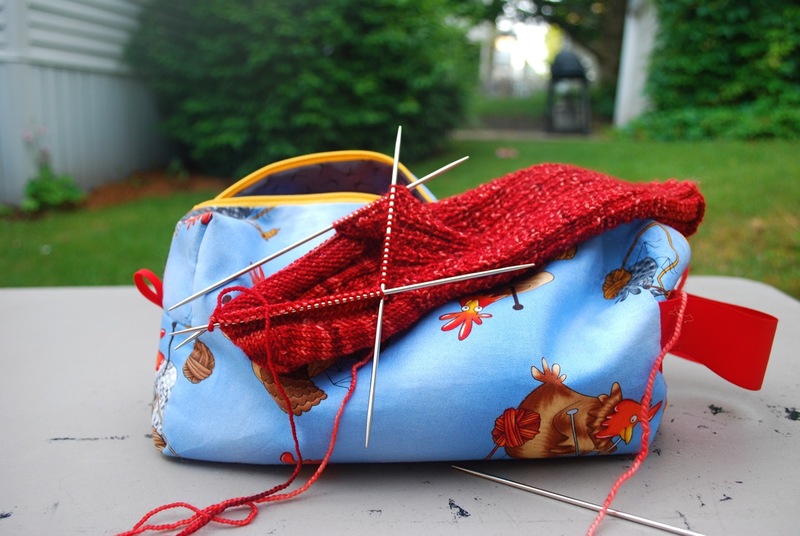 The one catch is that two of the rows are worked with larger size needles. 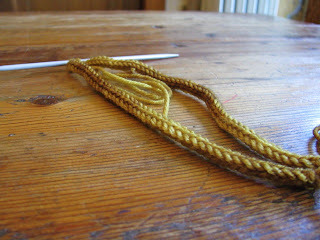 Work two rows with larger needles, work four rows with smaller needles. I made a mental note of it and highlighted it on the pattern. Still every time I made the needle switch, I found myself second-guessing. Two different size needles in my hand. Where am I? Every time I had to go back and count the rows to make sure I was using the right size needle on every row. While this project may not be the most calming, it is a good distraction. For days New England has been celebrating the Bruins and their Stanley Cup victory. It had been 39 years since we last won the Cup. It was time to party. 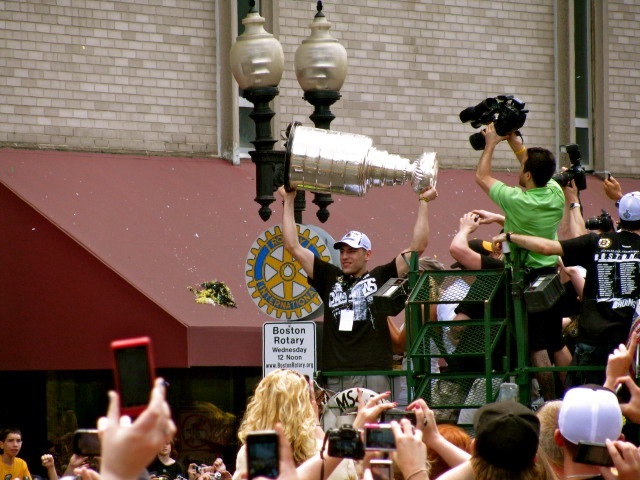 Part of the celebration included a parade through downtown Boston. It was a long hockey season, and I followed all the games. I wasn't going to miss the parade. 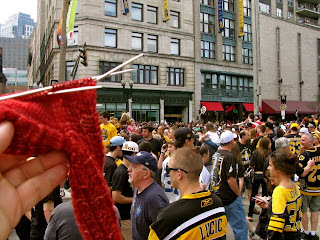 I had my Hedgerow Sock to keep me company while we waited for the parade to start. Hundreds of thousands turned out for the festivities. 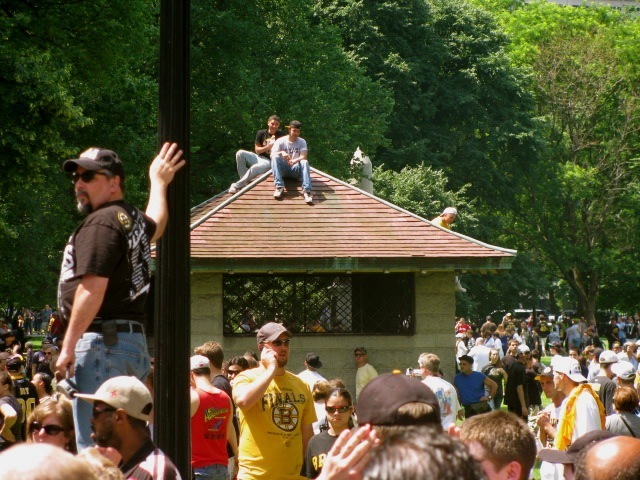 Some sought higher ground to get a better view. 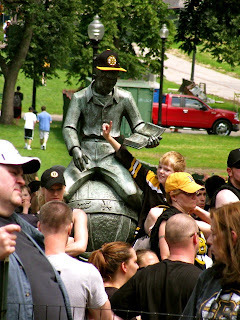 Everyone wore black and gold. Finally the duck boats arrived with the Bruins, and we got to view the prize. The party is over now. Life returns to normal. 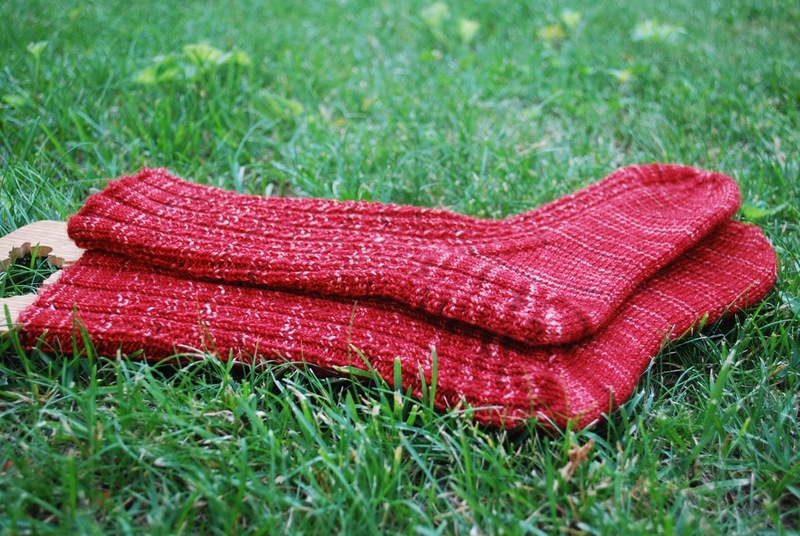 My Hedgerow Socks are finished. 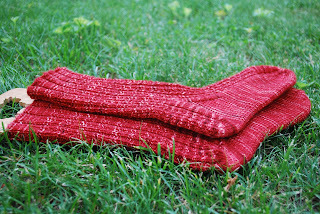 The yarn is Dirty Water DyeWorks Lillian, colorway Autumn Red. 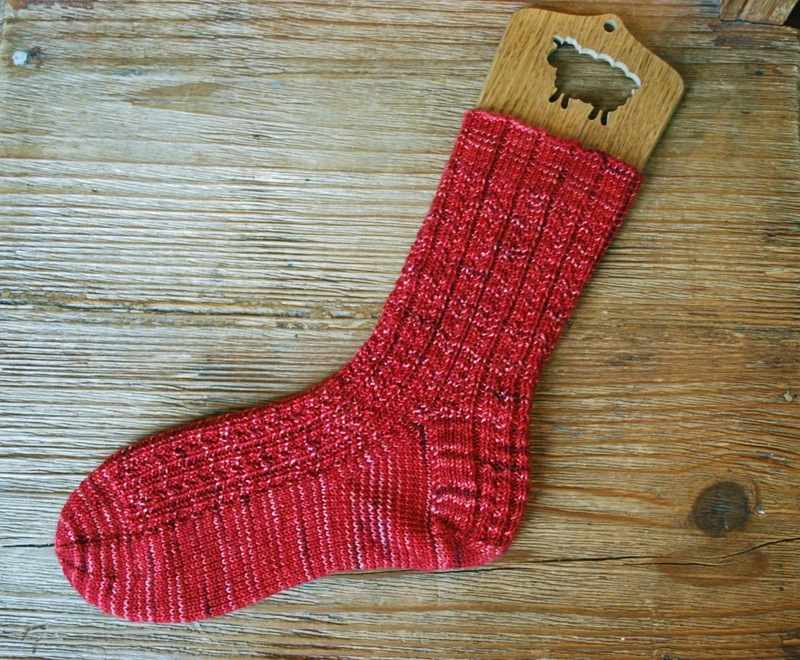 These socks are cushy and comfy. They will be ready and waiting when the next hockey season rolls around. And I'm on to something new. The beginning of Simmer Dim. 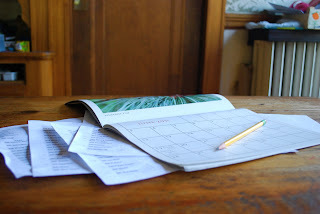 Over the last year I've made a concerted effort to keep an electronic calendar. 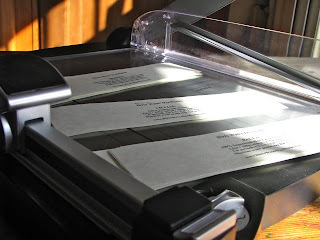 My kids urged me to make this paperless change. 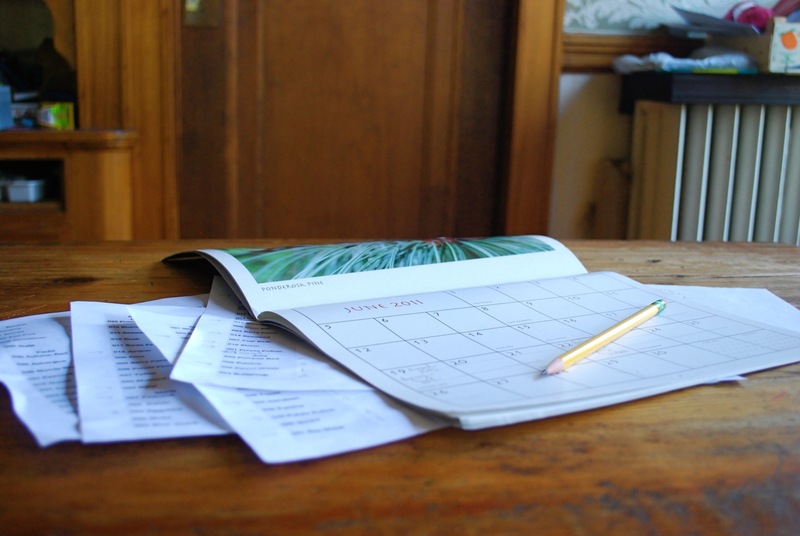 Enough with the post-its, appointment cards, week-at-a-glance calendar they said. Secretly I think they were embarrassed to see me scribbling appointment notes at the orthodontist's office, but I decided to give it a try. One of the perks of having kids is that they strive to keep you current. And let you know when you're not. I'm proud to say that I mastered this task of keeping an electronic calendar. I have everything from birthdays to appointments to sheep and wool festivals entered. My phone and computer calendars are synced as one. Work life, personal life - it's all there. The system has been working quite well until this week when I fell off the wagon and resorted to this. Pencil and paper. 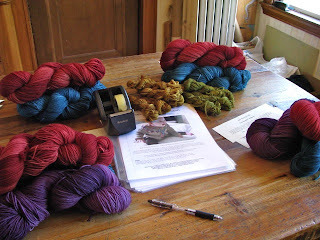 I've been working on a dyeing schedule for Sock Summit, making notes here and there. Before too long the notes piled up. I had a momentary lapse and pulled out the paper calendar to organize the notes and schedule the dyeing. Now that it's all laid out on paper I can see what I have to do when, and it's suddenly more manageable. Of course I have no idea if it conflicts with the rest of my life. As long as the kids don't discover I'm keeping a paper calendar on the sly, I can make adjustments along the way. 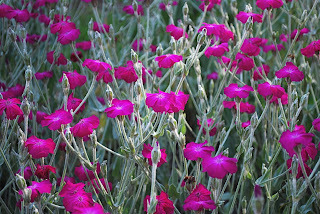 My neighbors' yards provide wonderful bursts of color up and down the street. 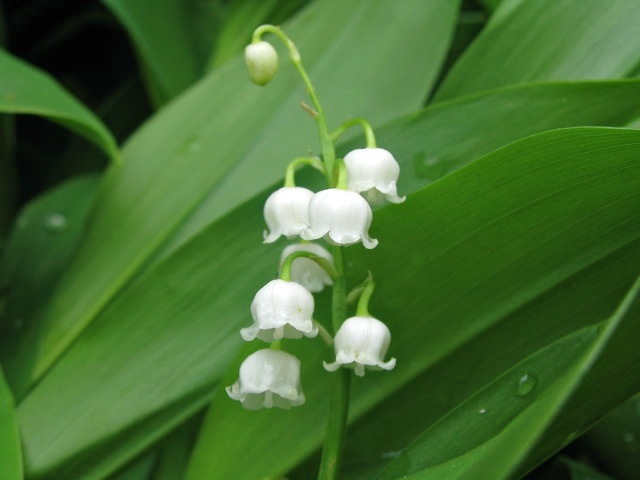 Since my own yard is often lacking when it comes to flowers and plants, I appreciate their efforts all the more. 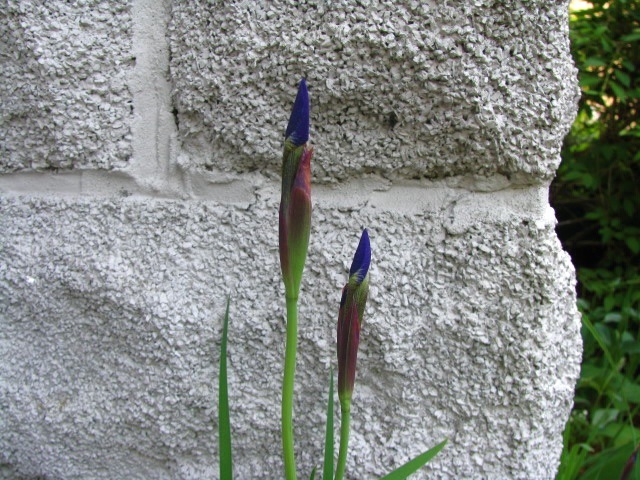 I have my neighbor to thank for this color inspiration of the week. 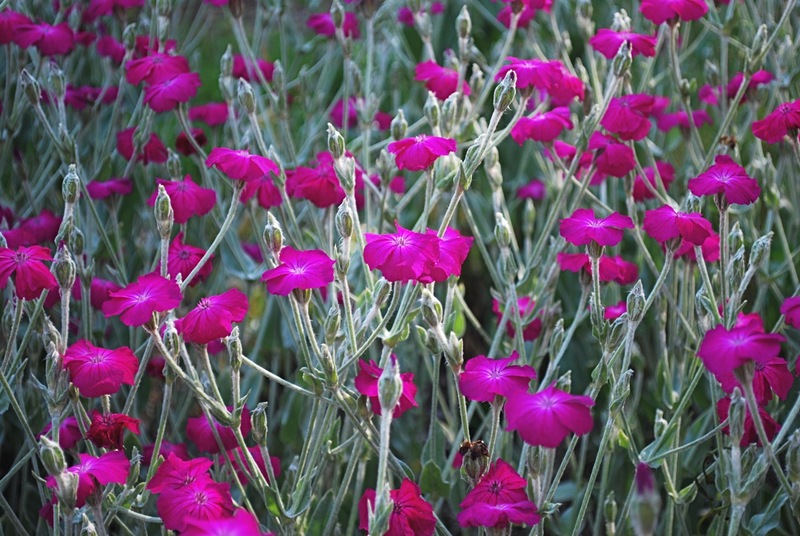 Sage green topped with fuchsia. Dyeing is a lot like cooking. There are recipes for cooking. Pick a recipe, assemble the ingredients, follow the directions and you should have something resembling the mouth-watering picture on the front. I'll admit that often it's not as easy as all that. But the fun part about cooking is that the recipe serves as a blueprint for other adventures in cooking. Take that same basic recipe and you can tweak it to your own taste - more spice, less salt, add this, omit that. Before you know it, you've created your own recipe. The possibilities are endless. The same goes for dyeing. Start with a basic color recipe. Yellow and blue make green. There are many ways to refine that basic green color. A little more yellow gives you a moss green. A little more blue gives you a pine green. As with cooking the possibilities are endless. And that's half the fun. Tweaking a basic color recipe can have subtle or dramatic results. I've been playing around with colors for a custom dye job. A little more of this, a little less of that. Like many knitters I start to plan a new project before the one I'm working on is finished. Once the end is in sight, I anxiously anticipate my next project. 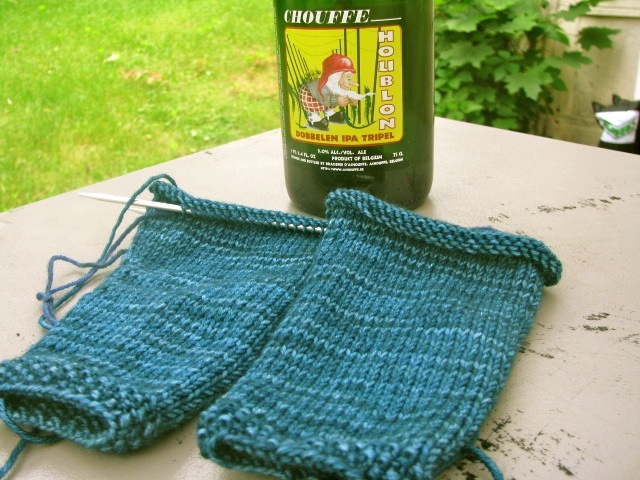 I'm sure I'm not the only knitter to do this. I think it's completely harmless unless it derails the project on the needles. But that's another story. In the midst of everything else this weekend I found myself doing a bit of plotting and planning. 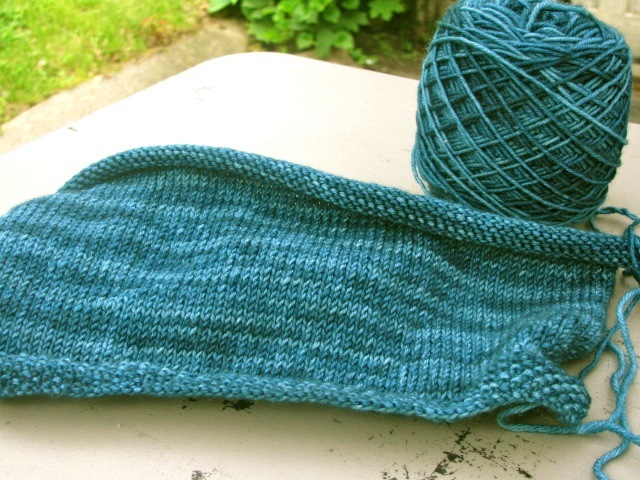 One of the Hedgerow Socks is off the needles. The other is on its way. With a week full of appointments, meetings and hopefully two Stanley Cup games, this sock won't be on the needles for long. My mind started to wander while I was working on the second Hedgerow, contemplating patterns and designs. 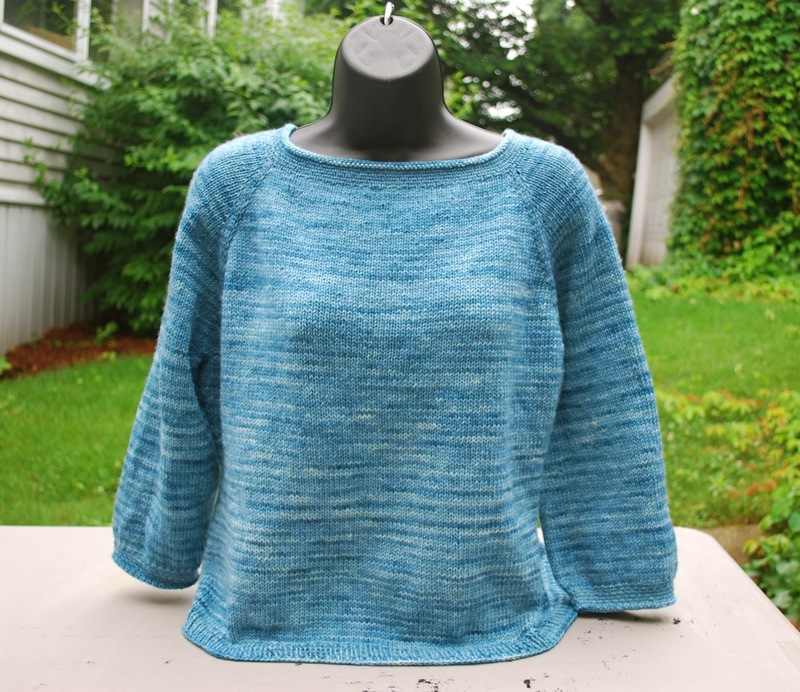 I finally settled on one that I had considered knitting several times in the past. That was the easy part. 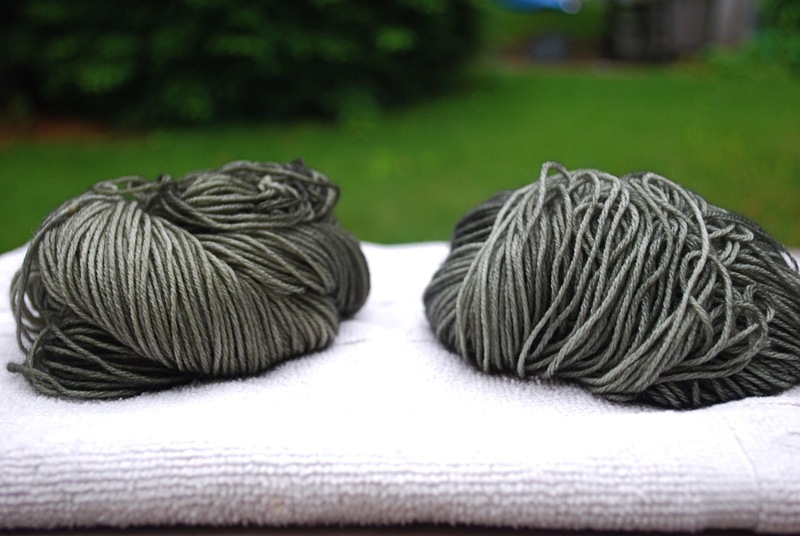 Now comes the hard part - deciding which color yarn to use. I may go for one of these. Both are lovely. Or I may choose something completely different. A splash of bright. Whatever I choose, I'm sure it will be fun. Our farmers' market opened last week, and I'm delighted. Nothing can beat fresh, local produce. The pickings are slim right now, but there will be more and more things as we get further along in the season. 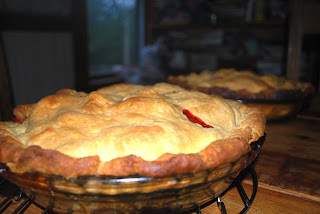 One of my favorites this time of year is rhubarb. Since rhubarb has such a short season, I make the most of it while it's available and buy as much of it as I can. Over the years I've earned quite a reputation. One of the farmers now calls me the rhubarb lady. As Garrison Keillor would say, "Beebopareebop Rhubarb Pie!" One of my goals this week was to catch up on things that I let slide during the spring. At the top of my list was to take a long overdue inventory of my undyed yarn. It's a boring job, but it's really important to know what I have to work with when I'm getting ready for a big event. I thought I had everything accounted for but decided to check one more closet. I'm so glad I did. Look what I found. 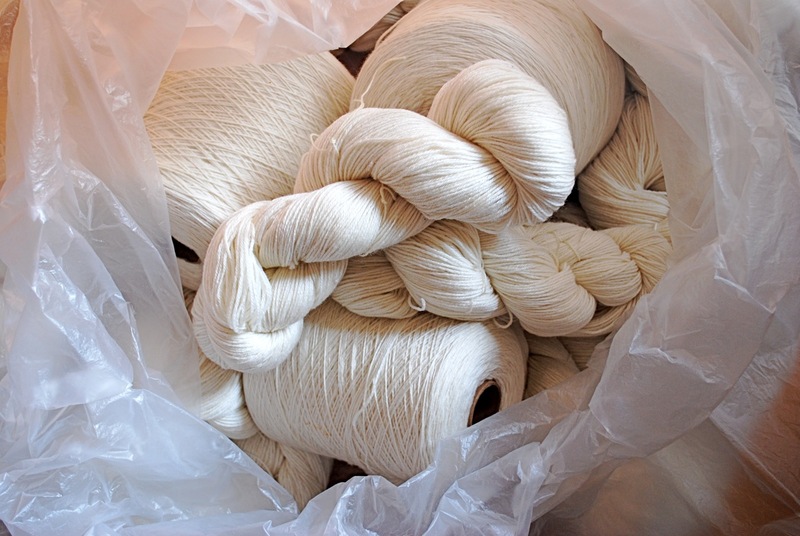 A big bag of undyed merino/bamboo yarn. 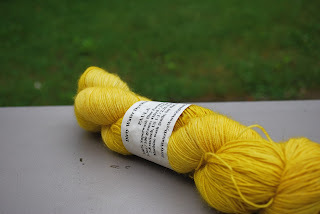 I had completely forgotten about this yarn. Finding it was a nice reward for all the time spent on counting and organizing. I can't wait to start dyeing it. 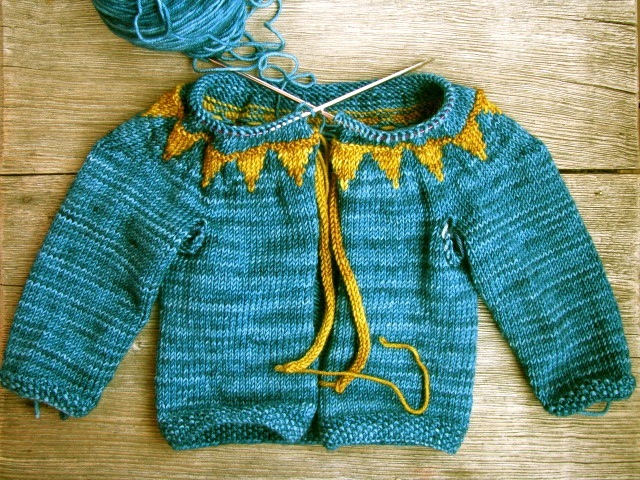 Speaking of organizing my website has been updated to include the Sweet Bunting Cardigan Kit. You'll find it listed after the Dipped Infinity Scarf Kit. I'm always looking at color combinations. Some work better than others. 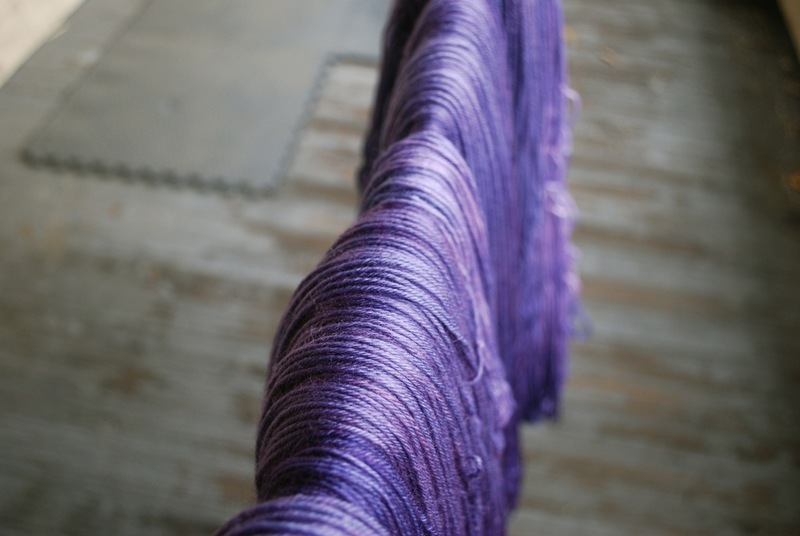 This purple with bright green is my color inspiration for the week. 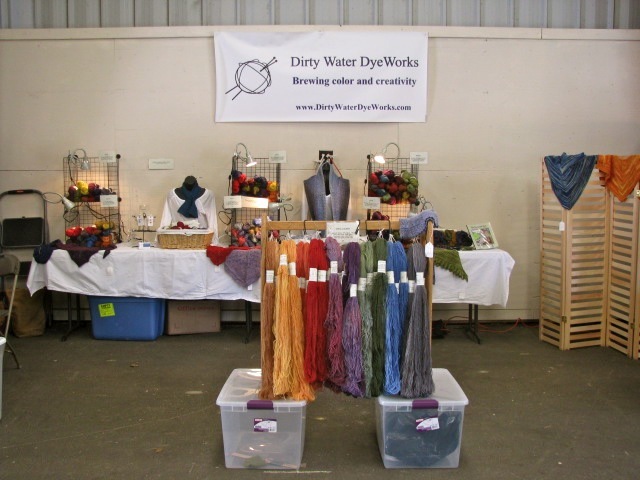 The spring fiber festivals are over here in New England. I feel a void after the flurry of activity - like I suddenly have extra time on my hands. While I do have a few weeks before my next event, I don't really have extra time. That's a false hope on my part. I am taking some time to figure out where I left off with the rest of my life. My family is intact and still functioning. I have a messy backlog of appointments, and my desk is buried in piles of paperwork that need sifting. It will take a few days to get caught up. And there is knitting to sort out. 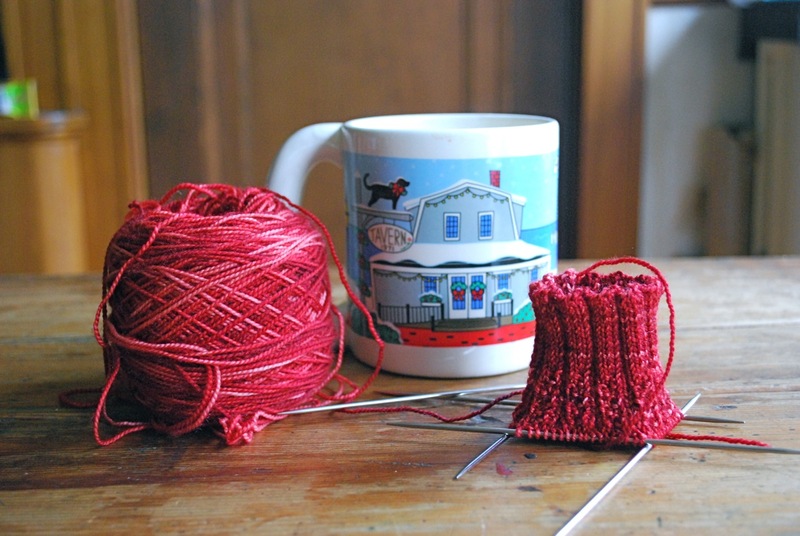 I had started this comforting sock before I became immersed in Sweet Bunting. I've been reunited with my Hedgerow Socks. Good company for the appointments that await me. 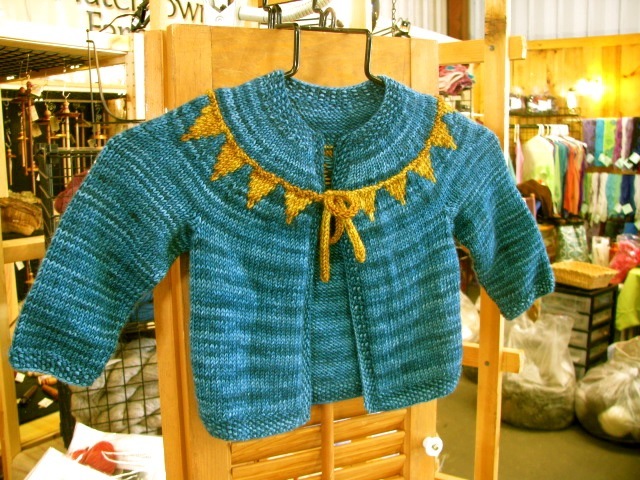 In past years the weather at Maine Fiber Frolic has been all over the map. There has been everything from extreme heat that makes you want to run and hide from all things wool to extreme wet that makes you wish you had a boat. This past weekend the weather was just perfect. We had comfortable, cool temps under bright sunny skies. It was ideal. This was my third event in four weekends. The booth was up and running in a snap. A new item was featured. Sweet Bunting Cardigan Kit made its debut. 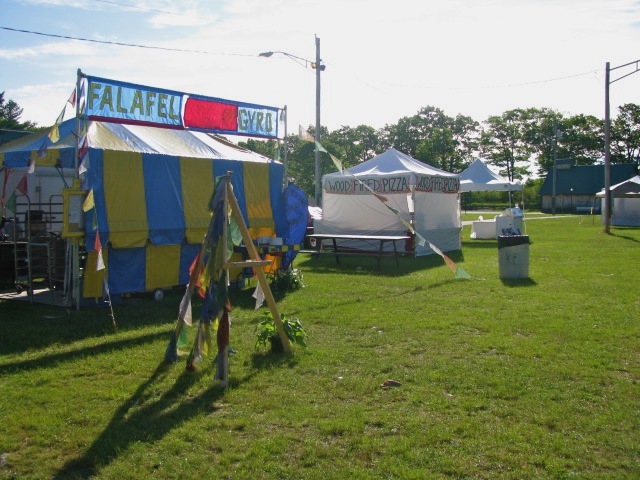 The food at Fiber Frolic includes traditional fair food - fried dough, french fries, Italian sausage - and a couple of other options. 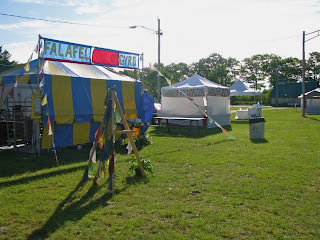 Falafel and wood fired pizza. Gourmet fair food. It was a great weekend for the outside vendors. This mushroom top awning is perfect for a vendor who carries felted gnome kits. It wouldn't be a fiber festival without sheep shearing. 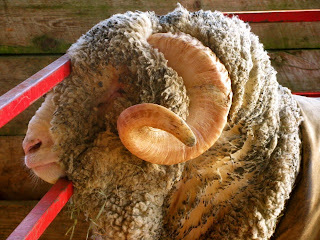 This Merino ram stood still long enough for me to get a shot. 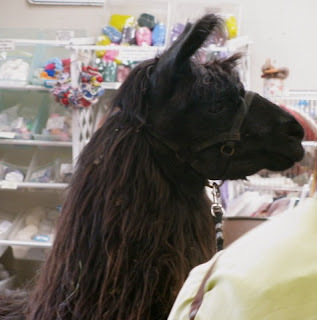 All weekend long llamas were on parade. This one strolled through the vendor building several times. This sweet baby would run away from me and then look back to make sure I was still watching. Such a tease. It was fun to catch up with some of the vendors whom I see only at this event. Thanks to everyone who came out to enjoy this great weekend! This spring we've watched as wild weather has wreaked havoc around the country. Earlier this week here in New England we witnessed an amazing lightning show complete with wind and rain. Tornadoes touched down in some areas. There was devastation and destruction, but nothing that compares to the losses in Joplin, Missouri. Virginia from Gather Here was moved by all the destruction in Joplin to do something positive. She's sponsoring a fundraiser to raise money for Red Cross relief efforts in Joplin. Take a minute to read about her fundraiser. Then check out the list of prizes. It's quite impressive. Consider making a donation to the Red Cross and enter to win one of these terrific prizes. Thanks to Virginia for her compassion, time and effort in organizing this raffle. 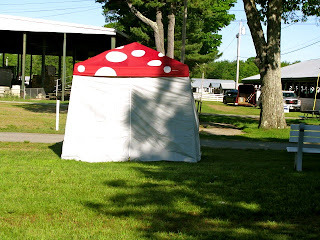 I'm packing it up and heading to the Maine Fiber Frolic for the weekend. 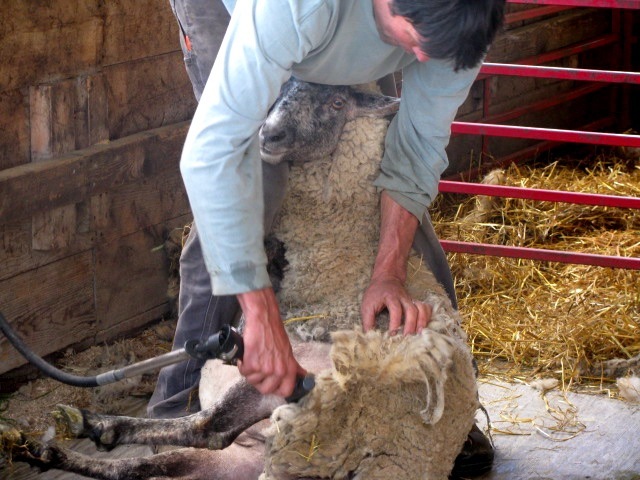 This lovely event includes shearing, workshops, fiber arts contests and a used equipment area. This is a wonderful family event. Stop by if you're in the area. 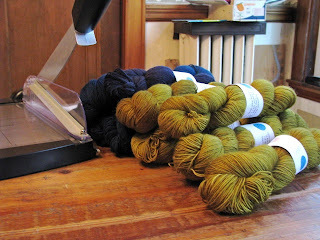 Packing always includes last minute details - twisting and labeling skeins of yarn. And making up a few kits. Anything that's not ready this morning will just have to wait for the next event. White. Is it a color or not? Lily of the valley provides my color inspiration for the week. I'm often bouncing back and forth between planning and production. It takes time and effort to organize and coordinate the events where I'm vending. And it takes time and effort to wind, dye and label the yarn. Even though I have a planning list that is screaming for my attention, this past weekend I was clearly in production mode. I'm gearing up for another event, so there was a healthy amount of dyeing. And to keep things lively I decided to push for another booth sample. I finished the pieces. All the pieces were assembled. Sweet Bunting Cardigan, the booth sample. Last night I had a productive knit night. 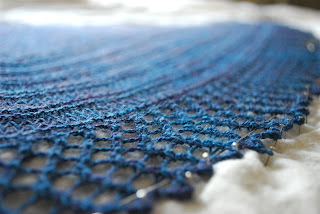 Sweet Bunting is finished except for weaving in a few ends. After blocking it will be good to go. 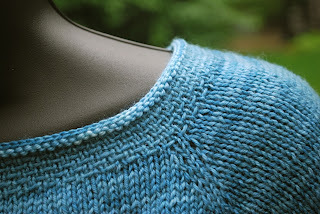 The sweater is just one piece of this project. Next up is assembling the kits that go with the sample. Production continues. It looks like that planning list will have to wait a bit longer.